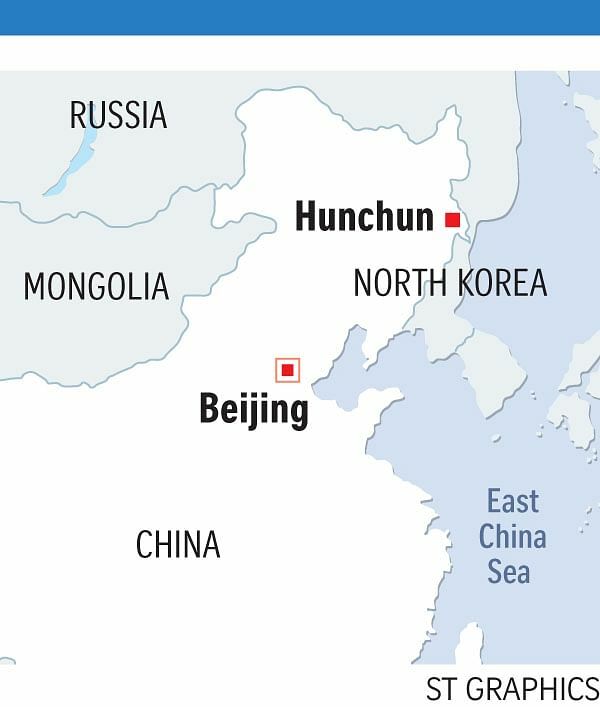 HUNCHUN (China) • At China's very farthest limits, a town sandwiched between North Korea and Russia stands at the heart of Beijing's plan to revitalise its bleak, frigid north- eastern rust belt. Beijing has a vision of turning the nondescript outpost of Hunchun into a regional Asian trading hub, and is spending tens of billions of dollars to turn it into reality. Less than 70km away in North Korea, Rason port offers sea access and a shorter trade route to Japan, one of China's biggest trading partners, than almost any of its own harbours. But the ambitious plan relies on Russian and North Korean cooperation and implementation, making it a monumental gamble. "Hunchun is the effective tip of the commercial spear for China as it tries to get more reliable access to the sea," said Professor Adam Cathcart of Britain's Leeds University, who runs SinoNK.com, a website on China-North Korea relations. "China is more broadly trying to make its frontiers more prosperous and open in terms of trade and less restive and more easily controlled." Hunchun has a population of only 225,000, but received investments totalling more than 100 billion yuan (S$22 billion) last year from government and private sources, according to the commerce ministry. A 42 billion yuan high-speed railway running 360km and linking it to Jilin's provincial capital Changchun is slated to open by October. City officials have budgeted 30 billion yuan to build a tri-national tourist zone enabling visitors to play golf in Russia during the day, dine in China and then gamble at a North Korean casino at night. China's north-east used to be the industrial heartland, but market reforms in the 1980s and 1990s led to layoffs at the state-owned companies that dominated the region. Chinese President Xi Jinping visited Jilin at the weekend and stressed its importance to economic restructuring and international cooperation, the official Xinhua news agency said. But last year, China's three north-eastern provinces - Heilongjiang, Jilin and Liaoning - took three of the bottom four spots in the provincial economic growth table. In Hunchun's main shopping area, the only foreigners to be seen were a few Russian customers. Russia has economic woes of its own, battered by Western sanctions over Ukraine and low energy prices. China's biggest joint economic project with the North so far has been in Rason, a special economic zone where it invested in two ports. chun locals say ties with North Korea have been frigid in recent years. Two Chinese entrepreneurs who have done business in Rason said their confidence was hit in 2013 when Pyongyang purged and executed Jang Song Thaek, its former point man on ties with China. Chinese entrepreneurs describe a frustrating business climate. Mr Peter Wu told Agence France-Presse: "Doing business in North Korea is completely unpredictable, they're really irresponsible."